Everyone has heard “the early bird gets the worm,” but how about “the second mouse gets the cheese”? Marcia and I represented Connecticut at the National Grange Convention, in Sandusky, Ohio. As a new State Master, we had to go early and learn how to be a State Master and delegate at the convention. There are eight new State Masters, four from New England alone. We were brought up to speed on National Grange trademark litigation, the California State Grange legal battle, and how we as new Masters will bond with each other with questions and ideas. We were then assigned mentors who would sit with us on the first day of session to explain and lead us through the delegate process of the National Grange. This session is a whole lot different than here in Connecticut. National breaks into committees that receive a packet of resolutions then breaks them into categories (adopted, amended, rejected, withdrawn, adverse, Grange policy). The committee presents the adopted package to the floor for action and then produces a policy statement that covers the vision of the National Grange for the next year. Connecticut sent four resolutions from our State Session. One passed (bat houses), 1 withdrawn (handicapped hotels), 1 rejected (paying non-delegate expenses at National Convention) and 1 is Grange policy (flavored milk). The committees meet throughout the convention until they complete the pile of resolutions. So each session you get a pile of updated pages to put in your notebook to have a updated packet (big waste of paper). Then there is a mad dash to finish. This year was the election of two Executive Committee members. Leroy Watson and Duane Scott were elected and installed. Delegates toured the NASA Glenn Research Center, which has the largest space environment simulation chamber and the rocket propulsion test stand. All very interesting to see. A membership report shows that Oklahoma had a net increase of 938 members this past year, one Grange had 320 members along, these members though are able to purchase insurance. 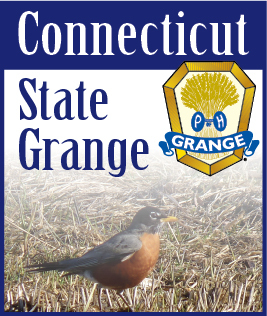 In discussion with State Granges many talk of new programs and ideas outside of the box to get new members. They all say we need to try new things or we will not survive. The Seventh Degree was conferred on 109 candidates. It was reported that 380 candidates received the degree last year in New Hampshire. Awards were presented at the Celebration Banquet and I wish to congratulate Ekonk Community Grange for their first place in the Community Service Contest. A job well done. The National Grange will continue to fight trademark infringement by receiving donations or taking a loan against the headquarters building in Washington, D.C. The fight in California over the old State Grange v. the new California Grange will go forward until we win. This litigation is about the Digest, the official rules of the National Grange. If we lose this then any Grange can violate the digest and the National Grange will have no legal claim to Grange property and assets. In the Fourth Degree, this is the season of relaxation and reflection, we relax with friends and family to enjoy the past year and to reflect on what worked and what needs improving. Increasing our membership is the only way our Granges can continue to grow so we must all commit to increasing the membership of our Granges. You should be hearing soon of new State programs for the upcoming year. I am still seeking committee members and Deputies but hope to fill all soon. Please take time to help those in need, with food, gifts, fuel bank donations just to help others have a better holiday season… for Grangers are known for their CHARITY! Happy Holidays to all. Noel.